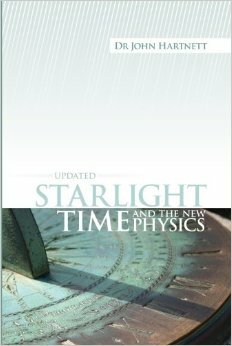 Starlight, Time and the New Physics describes the development of new physics based upon an extension to Einstein’s theory of relativity. Einstein’s theory applies very well to compact structures where gravity is strong but for large structures the size of galaxies and larger where gravity is weak there seems to be something missing. In the 1990s Prof. Moshe Carmeli of Ben Gurion University (Israel) built on the work of Einstein by adding a new dimension to the Universe—the velocity of the expansion of the fabric of space. This new theory applies not only to galaxies, and clusters of galaxies but to the Universe as a whole. It was discovered that when one used this approach one could described the observations without the need to add dark matter and dark energy—two fudge factors that are essential to modern ΛCDM big bang theory. Units are redshift. Blue dot is our galaxy near the centre. Carmeli’s theory may be equally well applied to the infinite, unbounded universe that is currently in vogue in the standard model as well as to a finite, bounded universe with a unique centre. This has the added benefit, though not essential for the model, that it applies to a galactocentric universe—that is, to a universe where our Galaxy is somewhere near the centre on a cosmological scale. My research so far, and it is ongoing, indicates that our Galaxy could possibly be about 100 million light-years from the centre of a great structure of galaxies arrayed on shells with a spacing of several hundred million light years. 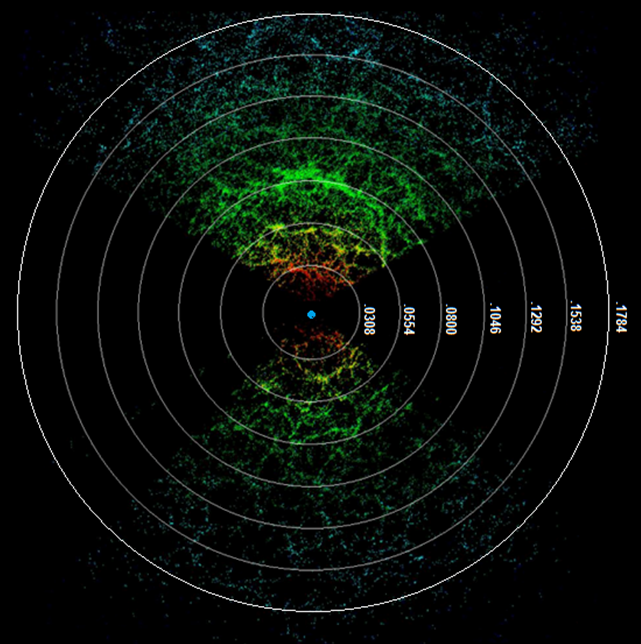 See left figure of a slice of about 50,000 galaxies from the Sloan Digital Sky Survey with concentric shells (rings) shown. This is a survey that creates a map of the locations of the galaxies around us in space. The map shows galaxies out to a few billion light-years. Each tiny dot represents a galaxy. It is actually 3-dimensional but only a slice is shown here; two wedge like sections from the survey look above and below the plane of our Galaxy. The areas where no galaxies appear is only because they were not mapped in those regions because dust in our own Galaxy obscures the view of the distant universe in these directions. Bible-believers should not find this to be surprising, as the Bible suggests (Ps 147:4) that the Universe is finite and if finite, then it could have an edge and a unique centre. But the idea is strongly resisted by many cosmologists who are unwilling to accept the possibility that our galaxy, at least, and mankind hold a special place in God’s creative purposes. Carmeli’s cosmology describes an accelerating expanding universe. 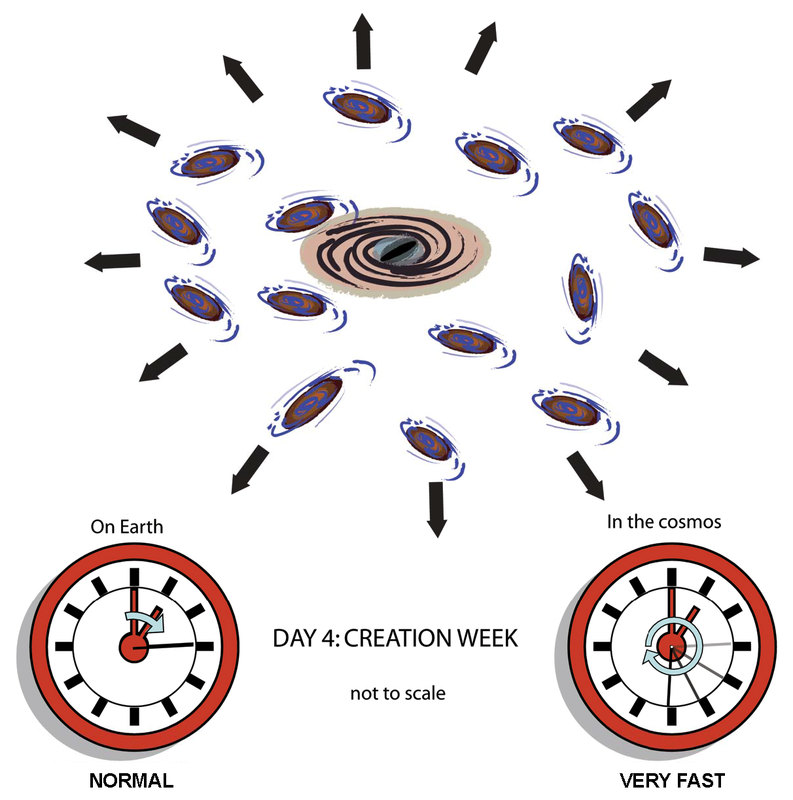 I appropriated his model and applied it to Day 4 of Creation week and posited, because Genesis 1 tells us that God created the cosmos on that day, that God enormously accelerated the expansion rate of the fabric of space over the 24-hours of Day 4 as he stretched out the cosmos with the galaxies in it. And at the end of Day 4 he stopped the acceleration of the expansion. There are scriptures that apparently describe God spreading or stretching out the cosmos. See, for example, Ps. 104:2; Isa. 40:22; 42:5; 44:24. Since writing the book though I have realized that those scriptures do not describe the type of expansion of at least a thousand fold that is needed. A tent or canopy just does not expand that much. Nevertheless, while Scripture does not overtly support the idea of cosmological expansion it does not deny the possibility. So that’s the important question. Which clocks is God referring to when He is talking about the Creation days of Genesis 1? I believe Earth clocks. The whole creation is focused on Earth. It is all about this planet and man. God’s attention is wholly focused on His Creation here. Thus light, which arrives on Earth today, was emitted from galaxies at distances of even tens of billions of light-years away. Indeed, all light outside a distance of roughly 6 thousand light-years must be coming from Creation week. That means we are looking back in time to Creation Day 4 when God created the stars and galaxies in the cosmos. The heavens declare the glory of God and the firmament shows His handiwork (Psalms 19:1). The book can be ordered from CMI or Amazon.com, or some Christian bookstores. There are seven chapters (111 pages), which present the background to and the ideas of the new model to describe the origin of nearly everything we see in the Universe. There are very few equations but necessarily the content assumes some knowledge of astronomical terms. Nevertheless a glossary is included at the end of the book. This is the main section of the book intended for the average educated reader. In addition, there are six appendices (106 pages), which provide in-depth discussions and a full mathematical development necessary to support the model. Just to make sure, the model states that time dilation was applied earlier during day 4 for light to reach Earth and then at the end of day 4, all the clocks were somewhat synchronised?